Pcoombe closed T219519: Investigate using Web Share API for sharing on Thank You page as Resolved. Added this as a new button for supported browsers: Chrome on Android, and the latest Safari (12.2) on iOS. Pcoombe added a comment to T199733: Add es-419 as a supported 'preferred language' in Civi. @DStrine As I understand it this is blocking us from sending separate es and es-419 thank you emails? I brought it up because @jrobell asked me about progress on that. It's not urgent, but would be nice to get it done soon if possible. Okay, I tested this myself setting language=es-419 for a card payment, and my preferred language in Civi shows up as es_GB. Pcoombe updated subscribers of T199682: Localise most important DonationInterface messages to Latin American Spanish. Hi @Ejegg @DStrine, just checking what the status of this is? Pcoombe added a project to T220824: revise recurring SE pay-the-fee amount? : Wikimedia-Fundraising-Banners. Pcoombe added a comment to T218240: Create variants for fancy new opt in pages on payments wiki. Thank you page -- where can it point? : @Pcoombe can you advise on where this should go? Pcoombe created T220528: Use semantic elements (<a>, <button>). Pcoombe closed T215711: POTY banners are causing client side error during banner display on mobile AND desktop as Resolved. Pcoombe closed T219662: Add extra tracking data to utm_key on donatewiki as Resolved. Pcoombe created T219662: Add extra tracking data to utm_key on donatewiki. Pcoombe added a comment to T185326: Display accepted card types on donate.wikimedia.org. @CCogdill_WMF Did this ever get tested, or is it something you might be able to test soon? Pcoombe added a comment to T205122: en6C-specific survey on TY page. @spatton Is this (ability to target TY page surveys to a specific country) still something we would find useful? Pcoombe closed T205701: Try adding inline errors instead of alerts for missing amount/opt-in as Resolved. Pcoombe closed T219516: Merge all donation form scripts to central location as Resolved. Done! The only remaining inline script is in https://donate.wikimedia.org/wiki/Template:Optin/Default since we may still want to test variations of that. Pcoombe moved T219517: Donation <form> shouldn't be named "paypalcontribution" from Backlog to Donation forms on the donate.wikimedia.org board. Pcoombe added a project to T219517: Donation <form> shouldn't be named "paypalcontribution": donate.wikimedia.org. Pcoombe moved T217854: Can't use comma as decimal separator for Other amount in some banners from Backlog to Donation forms on the donate.wikimedia.org board. Pcoombe moved T219516: Merge all donation form scripts to central location from Backlog to Donation forms on the donate.wikimedia.org board. Pcoombe moved T219519: Investigate using Web Share API for sharing on Thank You page from Backlog to Thank you page on the donate.wikimedia.org board. Pcoombe created T219519: Investigate using Web Share API for sharing on Thank You page. Pcoombe created T219517: Donation <form> shouldn't be named "paypalcontribution". Pcoombe created T219516: Merge all donation form scripts to central location. spatton awarded T217854: Can't use comma as decimal separator for Other amount in some banners a 100 token. Pcoombe added a comment to T217854: Can't use comma as decimal separator for Other amount in some banners. Okay, I've changed desktop small banners and donatewiki to use type="text" with inputmode="decimal" so that a comma can be used as decimal point in any language or browser. Pcoombe added a project to T217854: Can't use comma as decimal separator for Other amount in some banners: donate.wikimedia.org. Thanks @spatton. That's annoying, but also helpful as it rules out it being related to the inline validation we added to banners. Pcoombe claimed T217854: Can't use comma as decimal separator for Other amount in some banners. Pcoombe created T217854: Can't use comma as decimal separator for Other amount in some banners. Pcoombe added a comment to T215939: Edits to text on payments page. Pcoombe awarded T200517: Emit lint error or category when a page uses duplicate HTML IDs a Like token. Pcoombe updated the task description for T217215: Toggle state in WikiEditor toolbar is not obvious. Pcoombe created T217215: Toggle state in WikiEditor toolbar is not obvious. Pcoombe closed T216830: "Other" translation can spill out of button when it's long as Resolved. Should be fixed. These changes allow the "Other" translation to wrap, and vertically center by applying display: table-cell; vertical-align: middle; to the button (among other things). Pcoombe moved T210587: Donation leads to missing Thank you/vi page from Backlog to Thank you page on the donate.wikimedia.org board. Pcoombe moved T216830: "Other" translation can spill out of button when it's long from Backlog to Donation forms on the donate.wikimedia.org board. Pcoombe created T216830: "Other" translation can spill out of button when it's long. Pcoombe closed T202430: Stop using tables for form layout on donate.wikimedia.org as Resolved. Done, it's using flexbox for the main layout now. 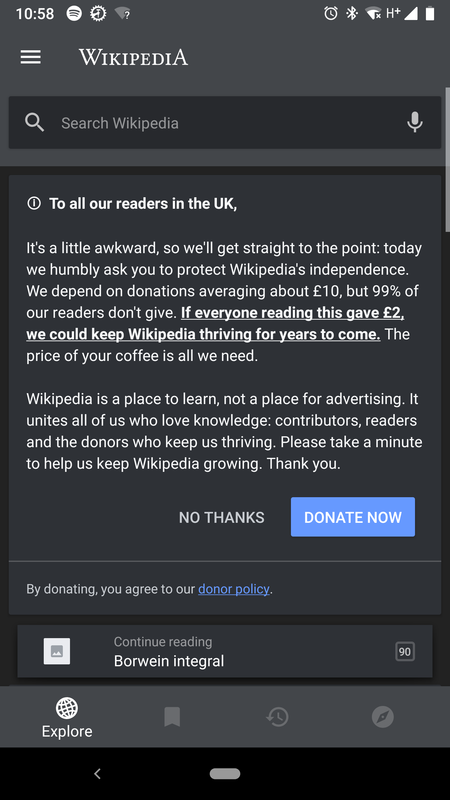 I also fixed up https://donate.wikimedia.org/wiki/Template:Quote to be more semantic and not a table. Pcoombe added a comment to T191417: IE11: dsk lg PTF opens immediately on banner load w/o amount selection. Pcoombe created T216150: New message inclusion syntax strips <span> with more than one class. Pcoombe updated subscribers of T215711: POTY banners are causing client side error during banner display on mobile AND desktop. The issue with RML.js should be fixed, although I don't understand why these banners were including it in the first place as it is only intended for fundraising banners. I also fixed a call to undefined frb.insertInlineBanner() in POTY 2018 R1 New. Pcoombe added a comment to T213209: Reduce recurring TY emails. If you make a recurring donation, you will be debited by the Wikimedia Foundation until you notify us to stop. We'll send you an email receipt for each payment, which will include a link to easy cancellation instructions. Thea will update our banners with this. @MBeat33 We don't include the donate@ email in the banner yet, so that could be added. It may cause you to get more unrelated emails though. Pcoombe updated subscribers of T213209: Reduce recurring TY emails. Pcoombe added a comment to T213948: Update SciPy on frdev1001. Actually looking into it v0.18.0 does fix the main bug which affects us (in the Mann-Whitney statistical test). So that would be great if an update to Stretch is planned soon anyway? Pcoombe moved T213949: Update fundraising analysis tools to use Python 3 from Analysis to Blocked & not fr-tech on the Fundraising-Backlog board. Pcoombe triaged T213949: Update fundraising analysis tools to use Python 3 as Low priority. Pcoombe created T213948: Update SciPy on frdev1001. Pcoombe added a project to T212177: Closing donation banner breaks scrolling: Wikimedia-Fundraising-Banners. Thanks, banner team will look into this one. Pcoombe closed T211335: Possible to make a recurring Amazon attempt in mobile large banner as Resolved. Pcoombe closed T211452: Changing Bitpay Logo as Resolved. Pcoombe closed T211332: Mobile banner nag shows up when editing as Resolved. Pcoombe added a comment to T211435: Give jsamra access to /srv/br on frdev1001. @cwdent Changing to the fundraising group sounds good. Jasmeet is working directly for us now, rather than via CPS. Pcoombe added a project to T211528: Copy and paste does not work in Source code editor: CodeEditor. Pcoombe created T211435: Give jsamra access to /srv/br on frdev1001. Pcoombe updated subscribers of T211332: Mobile banner nag shows up when editing. @schoenbaechler The following should work. Since the nag is fixed position, hiding just that (not the inline banner) when the search overlay opens isn't an issue. Pcoombe closed T211249: Banners allow Other Amount=0 if fee selected as Resolved. Pcoombe created T211335: Possible to make a recurring Amazon attempt in mobile large banner. Pcoombe created T211333: Changed amount tracking not working correctly with Other field?. Pcoombe created T211332: Mobile banner nag shows up when editing. Pcoombe claimed T211249: Banners allow Other Amount=0 if fee selected. Pcoombe closed T211214: Remove payment methods header image as Resolved. Pcoombe closed T211214: Remove payment methods header image, a subtask of T209801: Run English 2018 fundraising on apps, as Resolved. Pcoombe merged T211100: Implement CodeEditor on Special:CentralNoticeBanners into T65295: Add the CodeEditor to the edit area for the HTML banner. Pcoombe merged task T211100: Implement CodeEditor on Special:CentralNoticeBanners into T65295: Add the CodeEditor to the edit area for the HTML banner. Pcoombe added a comment to T209379: Is the Peru form working? Nov 13th. Can we reduce this from UBN since Peru donors aren't being sent to dLocal any more? Deskana awarded T210650: Typo in "Ways to give" on donate.wikimedia.org a Like token. Pcoombe claimed T210587: Donation leads to missing Thank you/vi page. Oh, that's not good. As a stopgap I've redirected Vietnamese and other top 40 most used languages where we don't already have a translation to the English page. Pcoombe closed T210650: Typo in "Ways to give" on donate.wikimedia.org as Resolved. Pcoombe added a project to T210466: Wrong counting of the added text in the page history tools: XTools. Pcoombe added a comment to T205701: Try adding inline errors instead of alerts for missing amount/opt-in. Pcoombe moved T209996: IE11: Problem with card logo spacing on mobile large from Backlog to Browser specific on the Wikimedia-Fundraising-Banners board. Pcoombe added a project to T209996: IE11: Problem with card logo spacing on mobile large: Wikimedia-Fundraising-Banners. Pcoombe triaged T209996: IE11: Problem with card logo spacing on mobile large as Low priority. Pcoombe added a comment to T209801: Run English 2018 fundraising on apps. Can we change 2017 to 2018 in the URLs i.e. Pcoombe added a comment to T209177: Get khaggard (new admin help!) access to frdev1001. I think the Python library we use for accessing the database wants .my.cnf to be in a certain format, with [client] on the first line. Pcoombe added a comment to T208508: Dutch TY email - minor address typo. I've fixed the translation on Meta at https://meta.wikimedia.org/wiki/Fundraising/Translation/Thank_you_email_20171019/nl. Can someone from fr-tech push it out? Pcoombe closed T168910: CentralNotice device selector checkboxes look all weird as Resolved. This appears to have been fixed now. Pcoombe added a comment to T207871: MWException on Special:PetitionData due to "selectSQLText called with incorrect parameters". This was just me testing out downloading the data. We don't actually need this extension anymore, I've filed T208081: Undeploy Petition extension. Pcoombe added a subtask for T106123: Extensions needing to be removed from Wikimedia wikis: T208081: Undeploy Petition extension. Pcoombe added a parent task for T208081: Undeploy Petition extension: T106123: Extensions needing to be removed from Wikimedia wikis. Pcoombe created T208081: Undeploy Petition extension. Pcoombe awarded T150562: Be able to force OATHAuth for certain user groups a Love token. Pcoombe created T207950: Repeated catchpoint alerts for donate.wikimedia.org. Pcoombe added a comment to T207414: Deploy Spanish (es) Thank You email. All looks good to me as well. Thanks! Pcoombe added a comment to T178402: Bahrain & Oman donation forms - minimum amount error. Pcoombe added a comment to T206607: Log viewport measurements during banner display. We would like to do that, but probably won't have time until January. Viewport dimensions is something WMF fundraising are very interested in too. Would you mind sharing the results of this with us when you have them? Thanks! Pcoombe closed T206865: WTG link after mobile geolocation error - not working? as Resolved. Oops, that's just a link that I forgot to update when Ways to Give moved to donatewiki. I've fixed it now. A bit late, but the logos will work in France now. Pcoombe added a comment to T204545: Add Carte Bancaire logo and enable card type logos in France. Thanks @schoenbaechler but the gradient on that extract doesn't look great and the file size would be a problem. It should be possible to do a proper gradient in SVG, but I've searched all over for an official version and can't find one. We could make our own but that would be time consuming and CB probably wouldn't approve. Pcoombe added a project to T206464: Page move/rename on mediawiki.org takes >48h: MediaWiki-extensions-Translate. Moving a non-translatable page seems to work fine, so I guess this is related to the translate extension. I've done this for the email opt-in now. Amount will be a bit more tricky as there's multiple possible error messages, and some need to include min/max amounts. Pcoombe added a comment to T206057: Opt-In form error message: possible to clarify?. Pcoombe closed T206168: Desktop lg opt-in radio buttons misaligned in Safari as Resolved. Pcoombe created T206168: Desktop lg opt-in radio buttons misaligned in Safari. Pcoombe claimed T206057: Opt-In form error message: possible to clarify?. Thanks Michael, that seems like a good suggestion. I'll look into it.